Andrea Beaumont, also known as the Phantasm, is a fictional supervillain and antiheroine in the DC animated universe created by Alan Burnett and Paul Dini. Beaumont first appeared as the main antagonist in the 1993 animated film Batman: Mask of the Phantasm, where she was established as the ex-fiancée of Bruce Wayne/Batman. Dana Delany provided the voice work for Andrea and Stacy Keach provided the electronically modified voice of her "Phantasm" alter ego. Andrea Beaumont has made occasional cameo appearances in various Batman titles in her Phantasm guise, often as a freelance spy, thief, and assassin. Andrea is based loosely on a combination of Judson Caspian (the Reaper) and his daughter Rachel, characters from the Batman: Year Two comic book mini-series. The Phantasm's costume was designed by Bruce Timm as per Alan Burnett's initial description of a Grim Reaper-esque character. Burnett wanted the villain to be reminiscent of the Ghost of Christmas Future, a similarity that the Joker mentions in the film. Timm went through approximately 20 different character designs for the Phantasm before creating a version that would evolve into the final design. Described by Timm as resembling a "tall, gaunt Death character", the Phantasm's costume is hooded and features a metal, skull-like mask. The Phantasm carries a large blade, reminiscent of a scythe, in her right hand. The blade was not part of Timm's original design, and was added later at Burnett's insistence. The character's left glove houses a chemically-based, artificial fog-generating device that the Phantasm uses for stealth, combat, and intimidation. At various points in Mask of the Phantasm, the Phantasm's manipulation of fog makes it appear that the character has supernatural powers, such as intangibility and the ability to disappear. These smoke-filled appearances were influenced by the Marvel Comics supervillain Mysterio. The Phantasm's facade is completed by a masculine voice provided by Stacy Keach, which was digitally altered in post-production to be deeper and echo. Portions of Keach's unmodified performance can be heard in Mask of the Phantasm's theatrical trailer, including the Phantasm's signature phrase: "Your angel of death awaits." The Phantasm's on-screen presence is accompanied by an eerie theme composed by Shirley Walker that prominently features the theremin. The screenwriters of Batman: Mask of the Phantasm included Alan Burnett, Martin Pasko, Paul Dini, and Michael Reaves. Pasko wrote many of the flashback sequences (including those featuring Andrea) and Reaves the final showdown between Batman, the Phantasm, and the Joker. In Mask of the Phantasm, producer Alan Burnett "wanted to do a big love story with Bruce because we hadn't really done it on the TV show. I wanted a story that got into his head." He also felt that the film's narrative should be removed from Batman's traditional rogues gallery. The resulting narrative, which dealt with Bruce's decision to become and remain Batman, hinged on the love story between Bruce and Andrea. Andrea's role in Mask of the Phantasm corresponds with that of the femme fatale from hardboiled detective fiction. Like classic femme fatales such as Brigid O'Shaughnessy from The Maltese Falcon, Andrea is a beautiful, intelligent woman who harbors dark secrets. The fact that Andrea is secretly the main villain is another convention of this stock character. Andrea also serves as a foil for Batman. The characters are very similar; they both don an intimidating costume and speak to the gravestones of their parents (as if holding a conversation with the deceased). The paralleling of their characters — most importantly the death of their parents at the hand of criminals — highlights how different they are: Though they both became vigilantes, Andrea chose to become a killer, following a warped code of "eye for an eye" justice, while Bruce chose to fight crime without taking anyone's life. Andrea Beaumont is the daughter of wealthy businessman Carl Beaumont and his deceased wife, Victoria. In her youth, while attending Gotham University, she meets Bruce Wayne, and they fall in love. He vacillates between his desire to lead a normal life with Andrea and keep the promise he made to his murdered parents to fight crime. Bruce finally decides to abandon crime-fighting — instead pledging part of his inheritance to the Gotham City Police Department — so he can marry Andrea. As Bruce proposes to her at his estate, the two discover the Batcave. Andrea is forced to break off the engagement when she learns that her father has double-crossed the Mafia. (Carl had set up dummy corporations for some of the most powerful mob bosses in Gotham, including Chuckie Sol, Sal Valestra, and Buzz Bronski. When they learn that Carl has embezzled from them, they demand immediate repayment. Unable to quickly access the money he had stolen and invested, Carl flees with Andrea to Europe.) A few years later, however, when Beaumont's father refuses to make donations to Arthur Reeves (a politician formerly in his employ), the young councilman sells information on the Beaumonts' whereabouts to the mob. Although Carl has repaid them, the vengeful gangsters want "interest, compounded in blood" and plan to have him killed. They send a hitman, who would later become the Joker, to do the job. Andrea encounters the hitman as he leaves her villa, and discovers her murdered father only moments afterward. Consumed with hatred, Andrea waits patiently for many years, planning to destroy the men who ruined her life. When she returns to Gotham, she dons a costume reminiscent of the Grim Reaper, complete with a smoke-generating device and scythe-bladed gauntlet. Disguised as such, and mistaken by everyone as Batman, she kills Sol and Bronski. After Bronski's death in the graveyard, Andrea visits her mother's grave, where she first met Bruce. Batman, also drawn to his parents' grave after investigating the crime scene, is shocked to see her. He quickly flees, but Andrea immediately realizes his secret identity. Batman later discovers the link between the mobsters and Carl Beaumont and questions Andrea, but she rebuffs him. The Phantasm attempts to kill Valestra, but nearly falls into a trap laid by the Joker. She escapes unharmed, but Batman attempts to apprehend her. After a brief rooftop skirmish, the Phantasm is able to abscond in a cloud of smoke as the police arrive on the scene. When Andrea realizes that the police will arrest Batman in her stead, she quickly changes out of her costume and helps him elude the authorities. At Wayne Manor, in a final attempt to conceal her vendetta, Andrea tells Bruce that the Phantasm is her father, Carl, and that she has returned to Gotham stop his murderous rampage. Andrea tracks the Joker to his hideout at the derelict Gotham World Fairgrounds, but he guessed her identity and anticipated the attack. The two battle in the "Home of the Future" exhibit, before the Joker lures Andrea to a giant turbine. He attempts to kill her by sucking her into it, but Batman intervenes, breaking the machine moments before its blades would have crushed her. Andrea attempts to justify her actions: "They took everything, Bruce. My dad, my life, you. I'm not saying it's right, or even sane, but it's all I've got left. [...] They had to pay!" Batman begs her to leave, and Andrea disappears in a cloud of smoke. After a stalemate battle between Batman and the Joker that sees both men on the brink of exhaustion, the fairgrounds - rigged with explosives - detonate and begin to crumble. Andrea reappears and explains that "one way or another, it ends tonight." With the Joker defeated and in her power, Andrea bids farewell and disappears with her captive before Batman can stop her. After escaping the fairgrounds' destruction through a series of sewers, Batman assumes that Andrea and the Joker have perished in the inferno. However, she survives and leaves a locket for Bruce in the Batcave as a keepsake. In the penultimate scene of the film, Andrea stands alone at night on the deck of an ocean liner. The Phantasm makes her first returning appearance in the comic Batman & Robin Adventures Annual #1 "Shadow of the Phantasm" (November 1996). In a direct sequel to Mask of the Phantasm, Andrea and Batman defeat Arthur Reeves, who - having been driven mad by the Joker - is determined to exact revenge on Beaumont. In Batman Adventures: Shadows and Masks, Andrea goes undercover in the Black Mask's organization, the False Face Society. During this story arc, she confronts Bruce at Wayne Manor and asks him not to interfere with her operation. He rebukes her, calling her a "killer". She eventually fights Batgirl and tries to kill Black Mask. The Phantasm reappears as an assassin in the season 2 finale episode of the television series Justice League Unlimited ("Epilogue"). Now an elderly woman, the Phantasm is hired by Amanda Waller to murder Terry McGinnis' parents. The psychological trauma, Waller reasons, would have steered Terry toward becoming Batman's successor. However, the Phantasm abandons the hit moments before she would have slain the young couple, unable to tear apart a child's life. The Phantasm argues that the murder would defile the Batman legacy by breaking Bruce's paramount rule to never take a life. Andrea's change of heart marks the official end of Waller's "Batman Beyond project", only to have fate compel Terry to eventually become Bruce's successor anyway. In the episode, Andrea has no lines or voice actor; her sentiments are conveyed through Waller's monologue recounting the event. The Phantasm returns in Mark of the Phantasm, a seven-part storyline in the digital comic Batman Beyond 2.0 (set after the Batman Beyond animated series). Andrea seeks out the great-grandnephew of Joe Chill, Jake Chill (a.k.a. Vigilante), for the murder of Terry McGinnis' father to ensure that Batman will not kill him. As in "Epilogue", she is hired by Amanda Waller. Andrea Beaumont is mentioned as an Easter egg in Batman: Arkham Origins, where postcards from Rome and Paris addressed to Bruce Wayne bear her signature. In Batman: Li'l Gotham, Phantasm's mask was placed on display in the Batcave. In conjunction with the release of Mask of the Phantasm in 1993, Kenner released a Phantasm action figure. 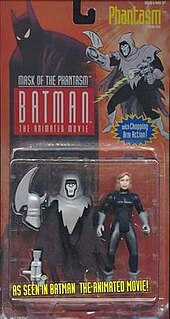 The toy was packaged with Phantasm's mask and cloak off, revealing the villain's secret identity, and — apocryphally — spoiling the reveal for audiences. This model was later re-released as part of a "Rogues Gallery" box set, but with the costume's grey and black coloring transposed. A subsequent action figure, cast from a new mold, was released by DC Collectibles in 2016. While of much higher quality than the original action figure, this Phantasm figurine does not have a removable mask. ^ a b c d e Dini, Paul, and Chip Kidd. Batman Animated. New York, N.Y.: Harper Entertainment, 1998. ISBN 0-06-107327-X. ^ a b c HBO. "HBO First Look: Batman Mask of the Phantasm." HBO (circa 1993). .
^ a b c Batman: Mask of the Phantasm. Dir. Eric Radomski and Bruce W. Timm. Perf. Kevin Conroy, Dana Delany, Mark Hamill, and Hart Bochner. 1993. DVD. Warner Home Video. October 4, 2005. ^ Comic Book Marketplace, No. 9 (Jan 1994). ^ Batman: Li'l Gotham #10 (March, 2014).